Before the rise of online photo-sharing Web sites such as Flickr, Web-based photo editors might have seemed seem a tad gimmicky. But today, as people increasingly upload photos to the Web or e-mail photos directly from their cameras and mobile phones, Flash-based online editors provide a useful service: letting you perform—right in your Web browser—the basic, routine editing tasks that most non-professional shooters need. Picnik ( ; basic version, free; premium version, $25/year) is just such a service, and it’s an appealing alternative to standalone photo-editing programs. It’s fun to use and easy to learn, thanks to plenty of help, and you don’t have to download or install anything. Simply upload the photo(s) you want to edit—or import them into Picnik from anywhere on the Web—and then use the program’s on-screen controls to perform basic edits. 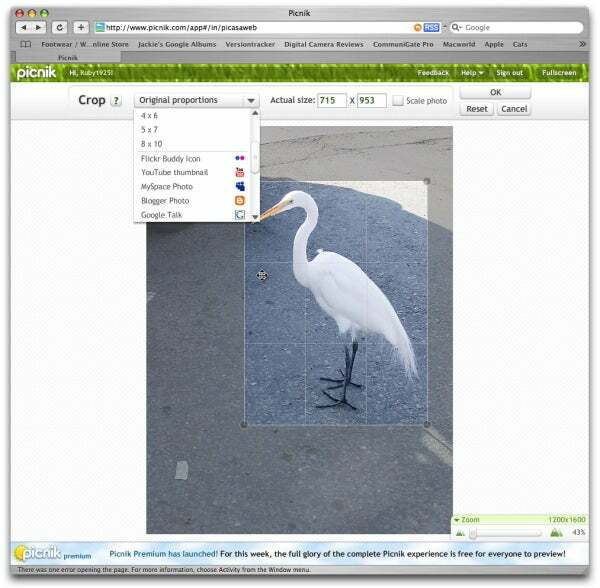 Picnik’s playful, green-grass-and-blue-sky interface—like a nice place for a virtual picnic—has five tabs from which all its controls are available: Home, Photos, Edit, Create, and Save & Share. Within each tab, multiple buttons or rollover-menu items give you access to the program’s main functions and advanced features. Most commands take you to a second, or even a third, layer of controls, including slider-bar adjustments for fine-tuning, a single Auto-Fix button, or both. An unlimited Undo encourages experimentation. Most people will be able to get away with the functionality offered in the free version, but if you want more—for example, most of the special effects, described below—$25 a year is the price you’ll pay. An original image open in Picnik’s Edit tab. Picnik works well in Safari and Firefox, as well as OmniWeb and Netscape; performance is swift and the various controls give the expected results. When you sign in to your account, Picnik’s Home tab presents you with a small frame of the last picture you edited, as well as the opportunity to upload a new photo. The Photos tab is the place where you bring images into the program—from any Web site, your computer, or one of Picnik’s photo-sharing partners. 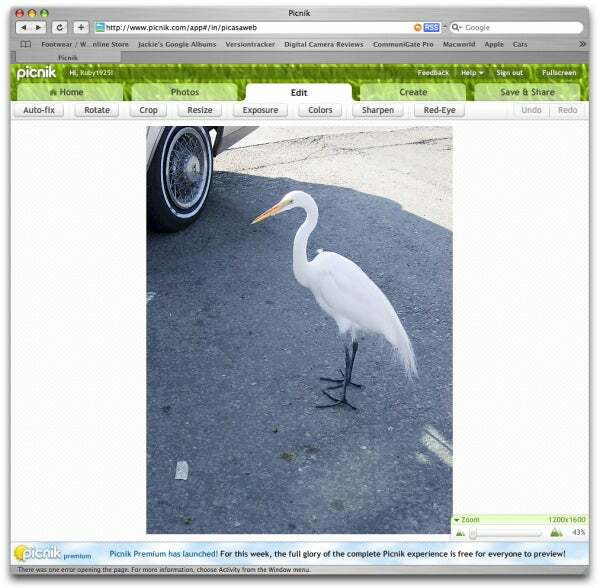 As long as a photo can be uploaded or accessed, it can be edited and redeployed in Picnik. Most image formats are supported, although Picnik doesn’t yet handle Raw images. The Edit tab serves as an entrée to the program’s image-editing power. Its eight buttons let you auto-fix, rotate, crop, resize, fix exposure, remove color casts, sharpen, or remove red eye. Most of those functions incorporate additional commands to refine your picture even further. Some, such as the Exposure tab, give you an option auto-fix or to use the standard controls; for example, Exposure and Contrast sliders that offer real-time previews as you work on fine details. An Advanced button opens another small window with sliders such as Highlights, Shadows, and a Brightness control connected to a Histogram. A handy Zoom slider is parked unobtrusively at the lower-right corner of all editing windows; you can also zoom using the scroll wheel of your mouse. Cropping a photo in Picnik. There’s a wide range of pre-set sizes to choose from. The Create tab lets you apply special effects and touch-ups to your image, as well as add text, shapes, and frames. The special effects filters run the gamut from useful (Black and White, Sepia, and Vignette) to gimmicky (Lomo-ish, Night Vision, and Pixelate), and some options here feel a little half-baked; for example, the choices in the Frames and Touch-Up sections are paltry. But there’s something for every taste, and many of the effects are unique and fun. Pencil Sketch gives some surprisingly nice results, as does Holga-ish, which often provides a more-pleasing black-and-white effect than the actual black and white filter. You can even use a brush to paint certain effects directly onto parts of your shot; this generally worked well, although I occasionally experienced some mouse lag and poor control. The Red Eye fix worked very well and the Teeth Whiten seemed miraculous. The Blemish Fix, on the other hand, was the weakest control in my testing; it worked only sporadically when trying to get rid of light spots on a light background and was often ineffective on light-dark combinations. Although generally easy to use, Picnik’s interface is inconsistent. For example, on the Edit tab, there are eight buttons across the top for accessing the major Edit functions (Auto-fix, Rotate, Crop, Sharpen, and so on); click on a button and its options are presented across the top of the browser window. But when you switch to the Create tab, the major functions (Effects, Text, Shapes, Touch-up, and Frames) are provided using a rollover bar rather than distinct buttons; click on a function and its options appear vertically down the left side of the browser window. Thankfully, the options are clear enough that this inconsistency doesn’t affect the program’s ease of use too much, but it’s nevertheless distracting at first. There are choices in how to alter exposure; I first adjusted the color temperature and then adjusted the saturation in order to get the color in the beak. 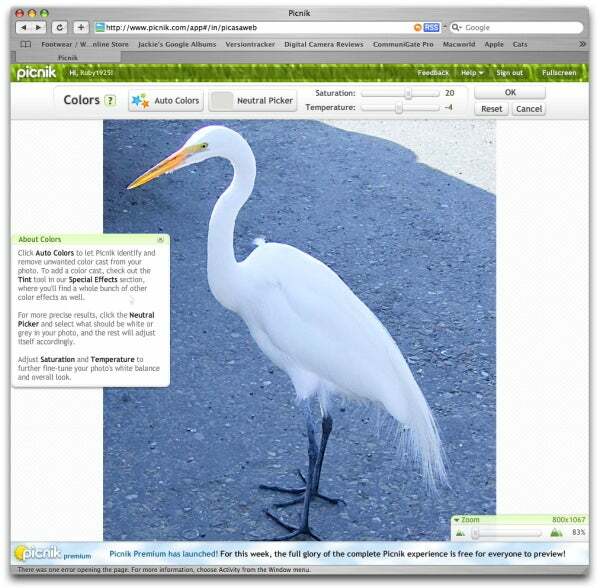 Picnik also offers several browser-specific features. For example, you can use a search engine to find online photos and then edit them in Picnik. You can also add an Edit In Picnik button to your toolbar—in Firefox, Safari, and Internet Explorer for Windows—that, when clicked, will take you to the last Web page you visited and present all its images for editing. And Firefox users can take advantage of an extension that adds an Edit in Picnik option to contextual menus and lets you capture an entire Web page as an image. Very slick indeed. Zooming in on the bird’s feathery underside, I used the Unsharp Mask tool to separate the feather strands. Of course, working online, while convenient, also has disadvantages. In order to use Picnik, you need a broadband Internet connection. You’ll also need a recent browser and a proper installation of Flash 9; this should be academic these days, but on one of my computers, an apparent browser-related glitch prevented Picnik from working at all. Picnik also has some fairly advanced system requirements for a Web-based tool: you’ll need a Mac with a 1GHz processor or better. If you’re using Photoshop for higher-end editing tasks, Picnik’s capabilities will fall short of your needs. But if your image-editing needs are more basic—if iPhoto is more your speed—you’ll love Picnik. It’s there to help you quickly whip snapshots into shape for sharing with friends and family, and it’s especially useful in conjunction with sites like Flickr, Facebook, Picasa, and Photobucket. With a broadband Internet connection and a fairly recent Mac, you’ll get a lot from Picnik. And there’s the added advantage that you can use it on a public workstation or a friend’s house without compromising your privacy—just sign in, upload and edit, and sign out. Despite some limitations and the current lack of variety in some modules, Picnik is a fine online photo editor, and the price is certainly right.